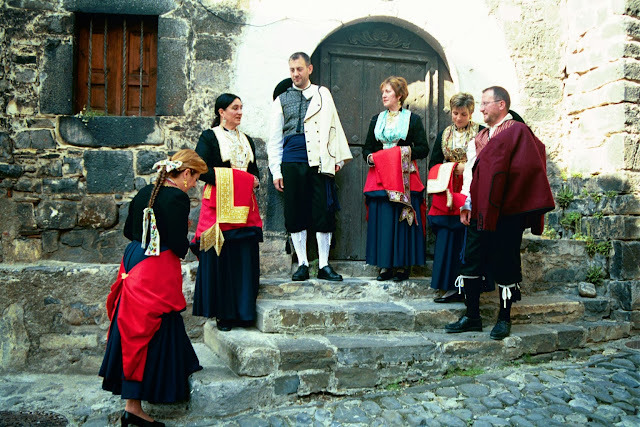 The Basques, of course, are the only remnant of the pre-Indo-European peoples and languages which remain. 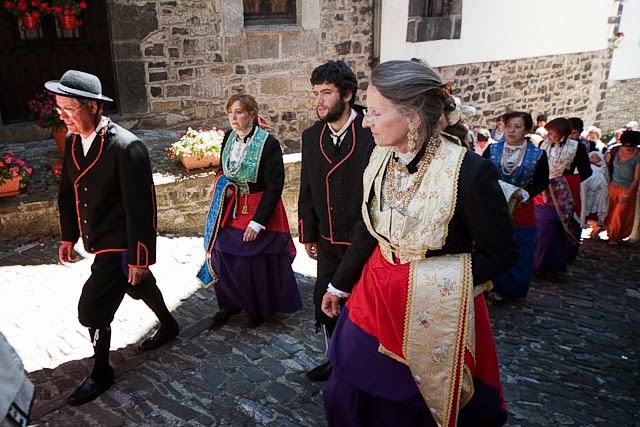 The Basque language, Euskera, and its relatives were once much more widespread, and it has been in retreat before Latin and its descendants for over 2,000 years now. 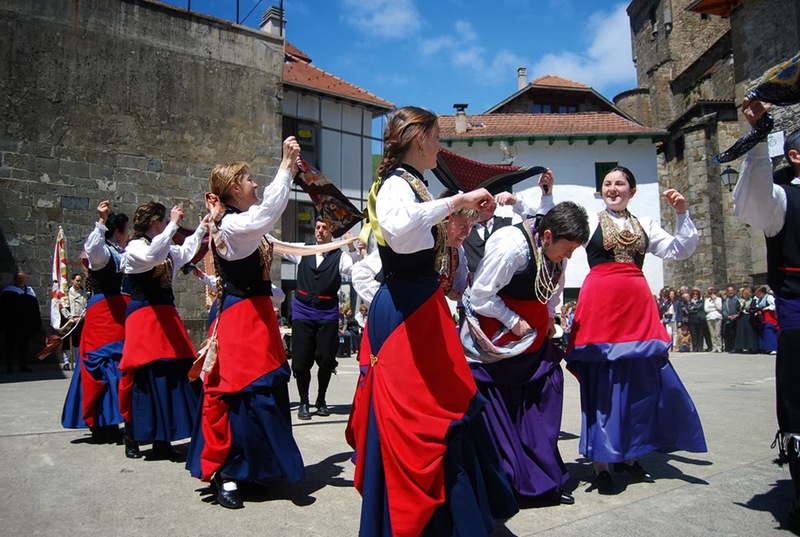 However, The Basque community and language is still very alive and vigorous today. The Basques are a unique people who have kept very strongly many of their traditions: in language, food, music, ceremonies, dance, and even sports. They have not, as a whole, held on to a folk costume tradition any more than the French or Spanish have. There are several distinct costumes native to particular areas, however, and this is one of them. 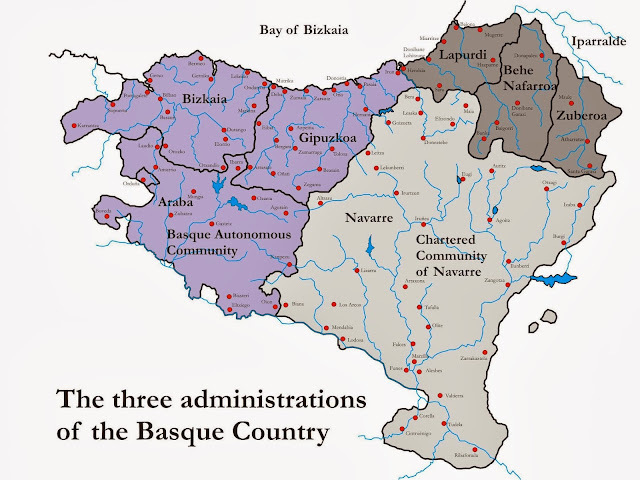 The Basque region is politically divided into three areas, the French Basque regions, the Spanish Basque regions, and Navarre. 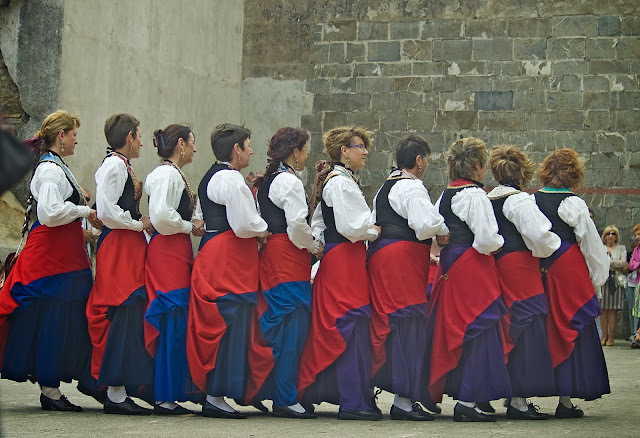 Navarre is split by language, the south being Castillian Speaking, and the north being Basque Speaking, south to about the level of Pamplona. 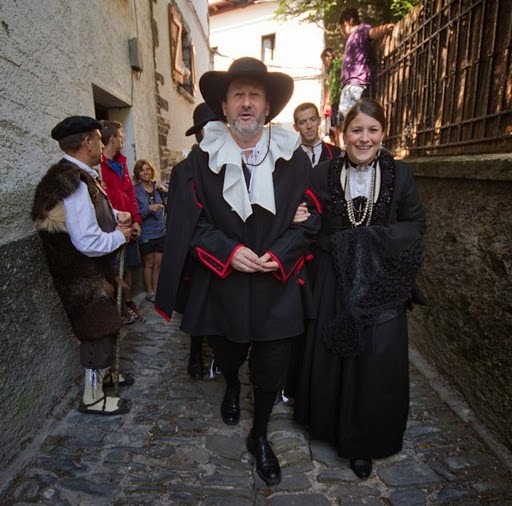 I should mention that Navarre has a long history as a separate political entity, and there are people who identify primarily as Navarese. 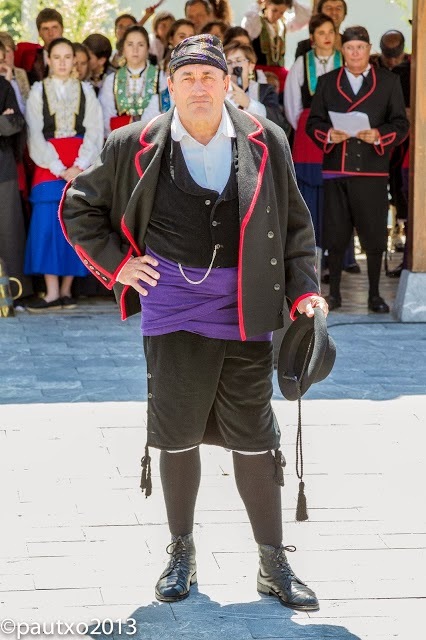 Today I am speaking about the costume tradition of northeast Navarre. 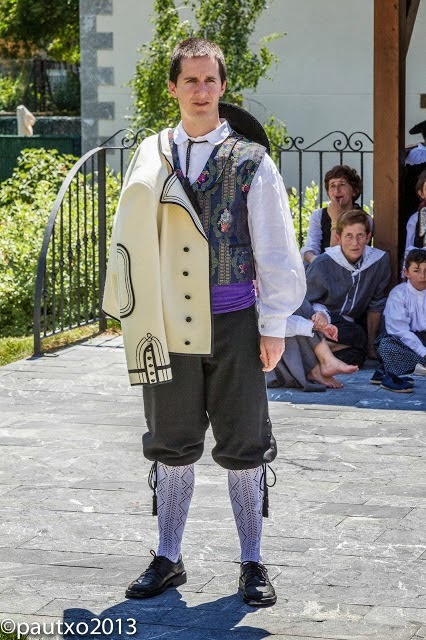 If you look at the map above, this costume covers the three river valleys in the easternmost part of Navarre, which are, from west to east, Aezcoa - Aezkoa, Salazar - Zaraitzu, and Roncal - Erronkari. This area is currently linguistically mixed, with most people speaking Castillian, and about 5 % still speaking Basque. These three valleys are more clearly seen in the following physical map of Navarre. 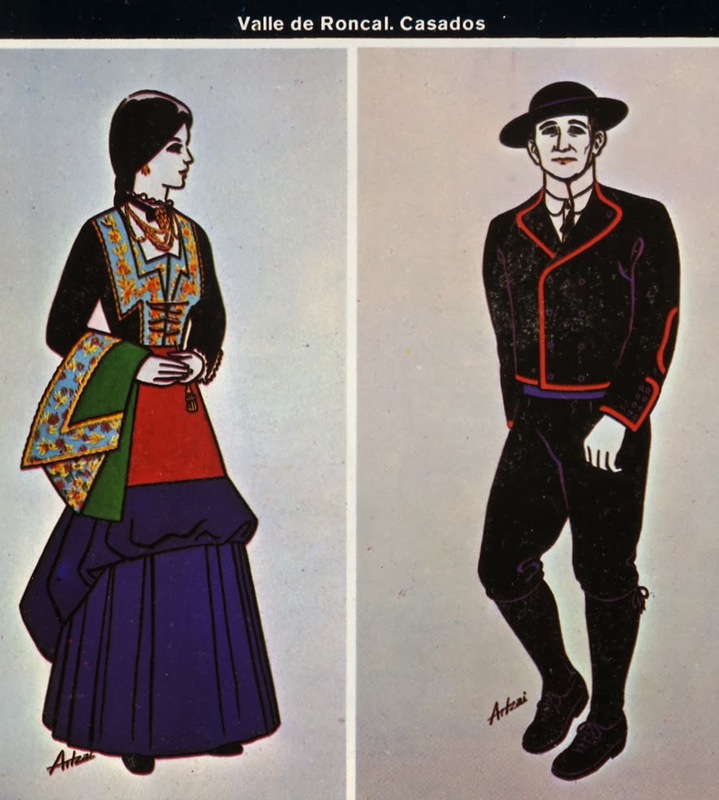 These three costume traditions are similar, but not identical. For the remainder of this article, I will focus on the costume of Roncal - Erronkari, mostly because I have found much more information on this costume compared to the others. For the woman's costume, the foundation garment is the chemise, camisa [i have only found the basque names of a few items of the costume]. As in most places, it was made of linen, later cotton, and was originally ankle length. 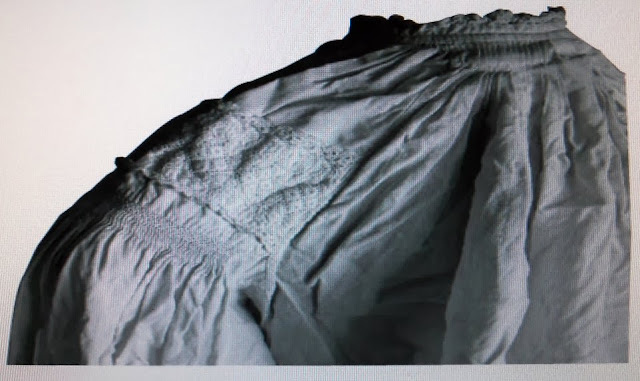 The opening is in the center front, there are shoulder inset pieces, [I am not sure from these photos whether the inset is sewn to the side or the top of the body, but it looks like they are sewn to the side]. 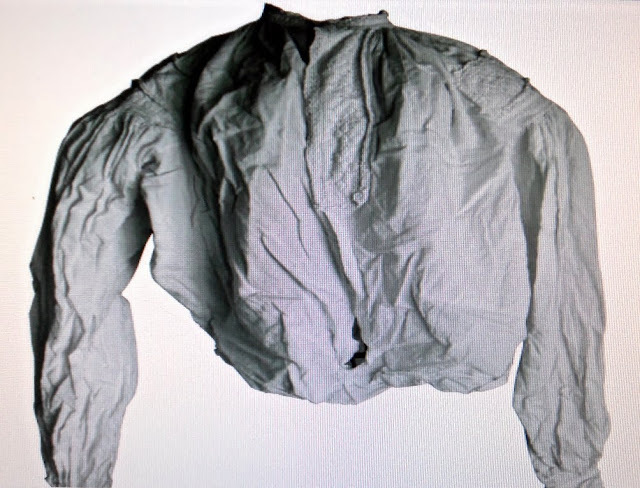 The body of the camisa is gathered into the neck, which is low, stands up, and has gathered lace on the edge. The sleeve is gathered into the end of the shoulder inset, and sewn perpendicular to the body of the chemise with gussets under the arms. The shoulder inset is ornamented with lace or embroidery [these are the best photos which I could find]. 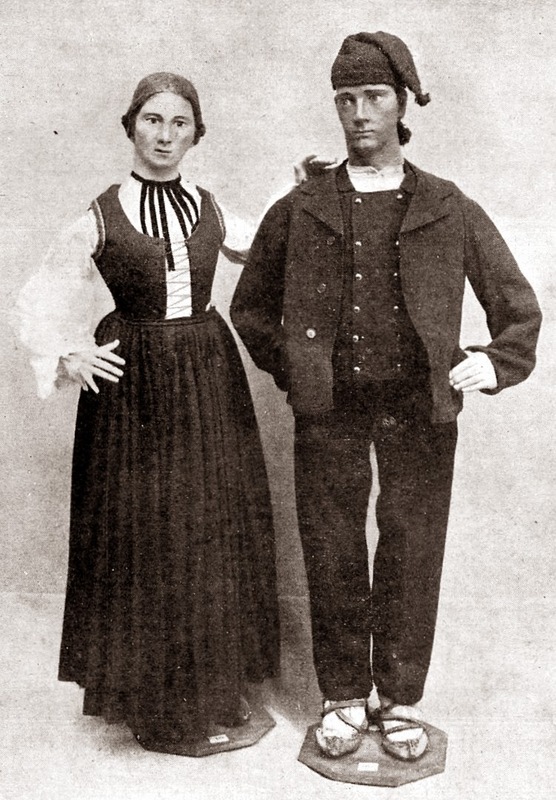 As in many places, the chemise was later sometimes separated into two garments, shirt and underskirt. 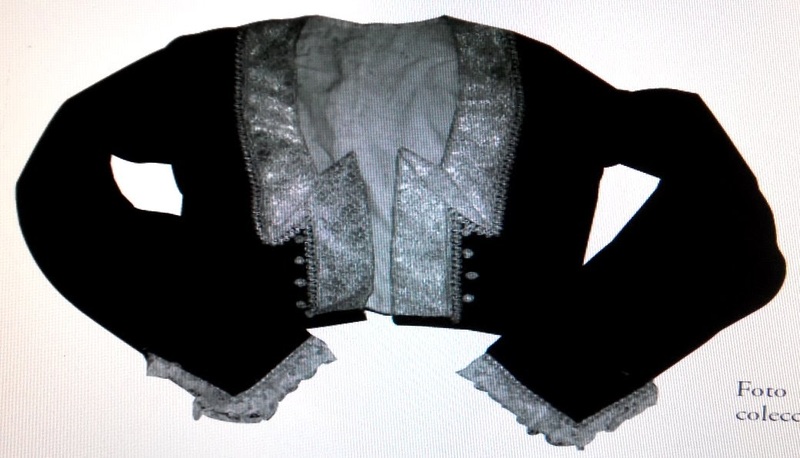 This piece also has embroidery or lace on a front placket covering the opening. 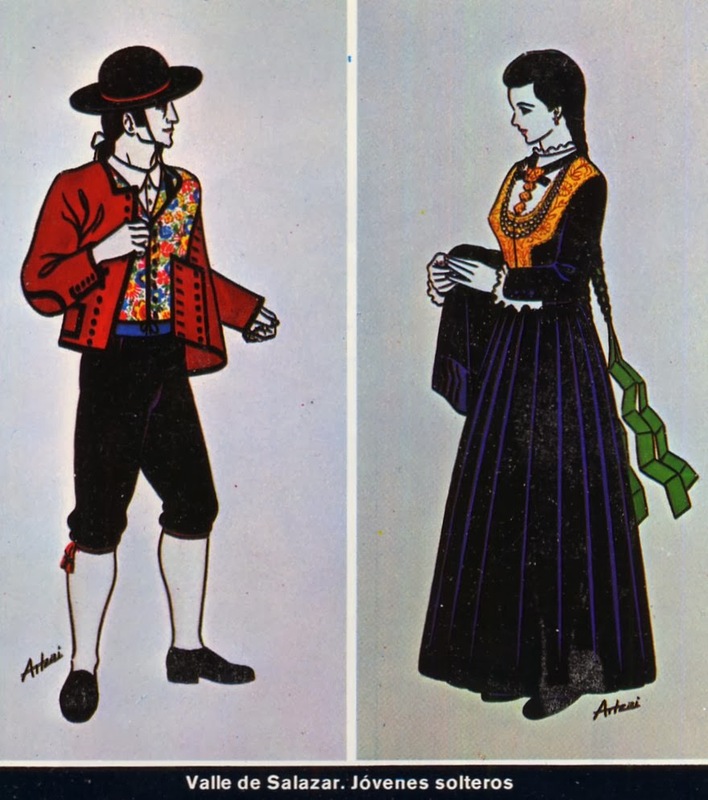 The bodice, justillo or korputx, has a distinctive notch in front similar to the costume of Fana in Norway or Spisz in Slovakia. This notch is not found in the costumes of the neighboring valleys. The front edge is ornamented with a colored ribbon. My sources speak of it being laced, but in the photos which I have found it seems to be hooked closed. In older photographs, this ribbon is of a plain color with embroidery and sequins sewn onto it. 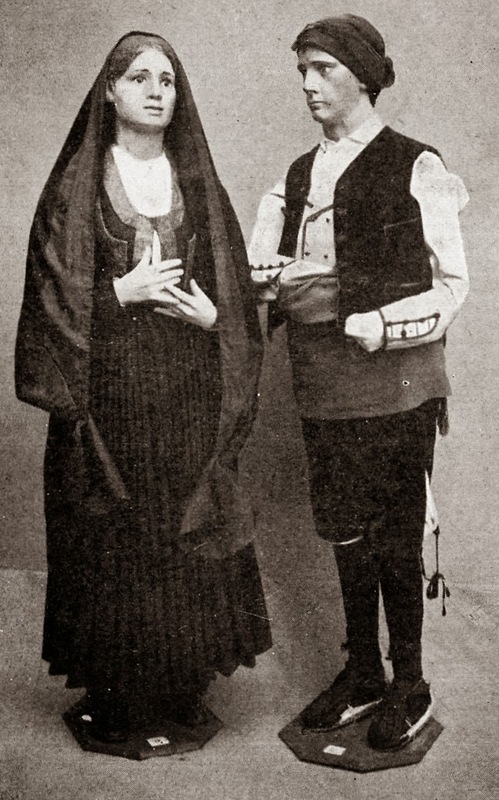 In more recent photographs it is more common to see the use of brocaded cloth. 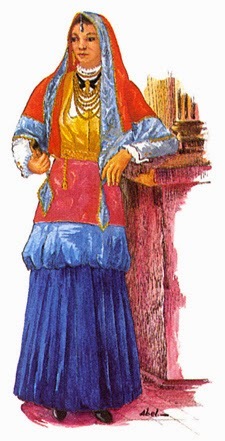 Over the long camisa, or underskirt with a short camisa, a petticoat of linen is worn. 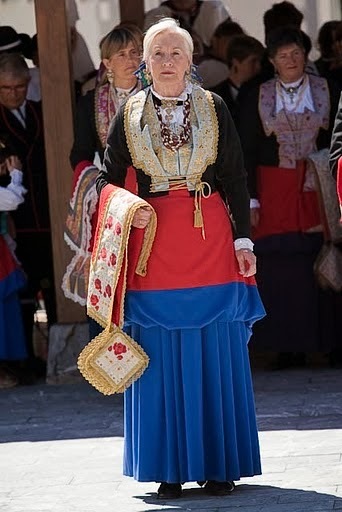 Over this are worn two wool skirts which are blue or violet. 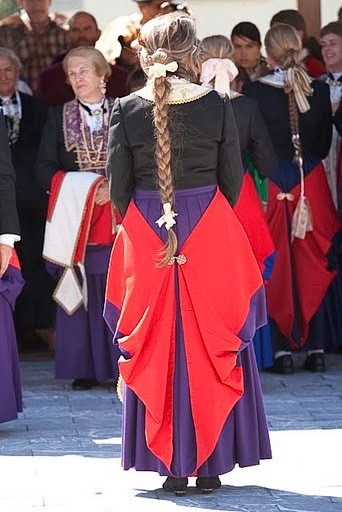 The top skirt is normally worn pinned up around the waist, showing a wide red facing sewn inside the hem which is called aldar. 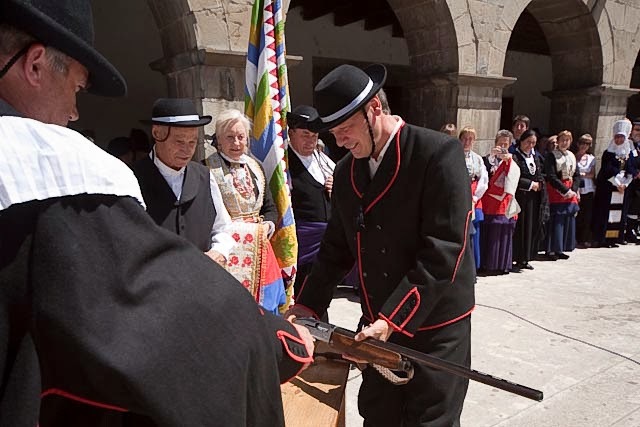 It is held in place by a pin or brooch called amabitxi. The hair is normally worn in a long braid, with a ribbon tied at the top, called zintamuxko. 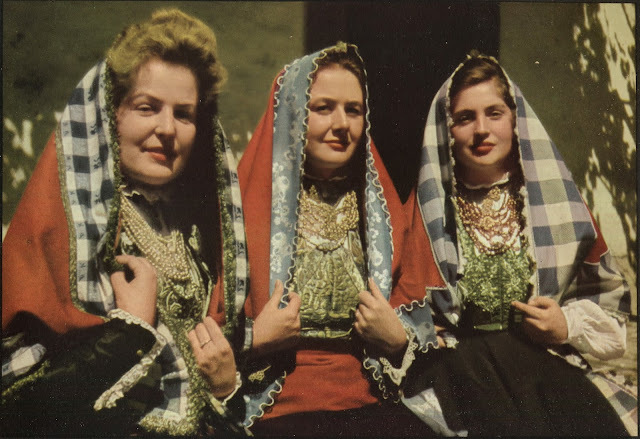 Bead necklaces are worn, and spectacular earrings, with a matching pendant which is attached to a velvet ribbon around the neck, called bitxi. 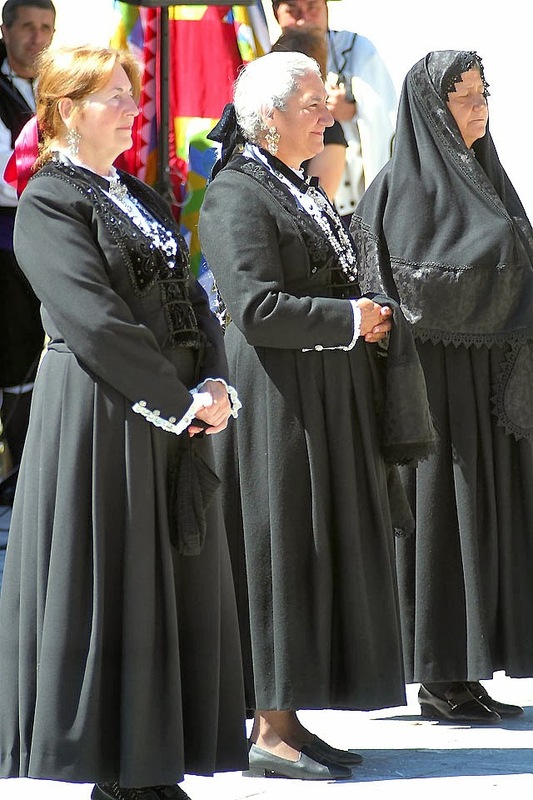 For formal occasions, a small cape called mantilla is worn over the head. This is mandatory for church attendance. It is shaped to cover the head and leave a view just to the front. It is edged with a wide band of fancy material, edged with trim. 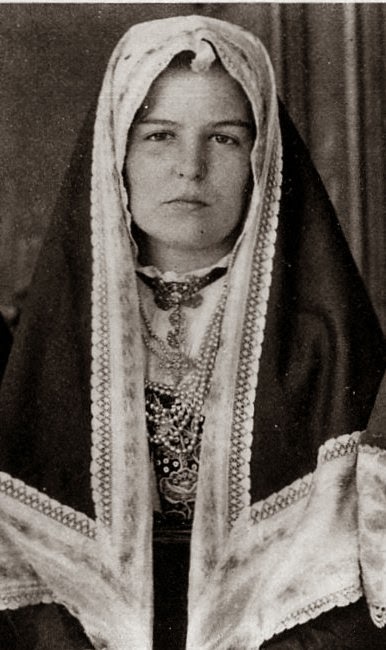 There is a small tassel in the center of the head opening; this was to facilitate the centering of the mantilla in a time when household mirrors were rare. 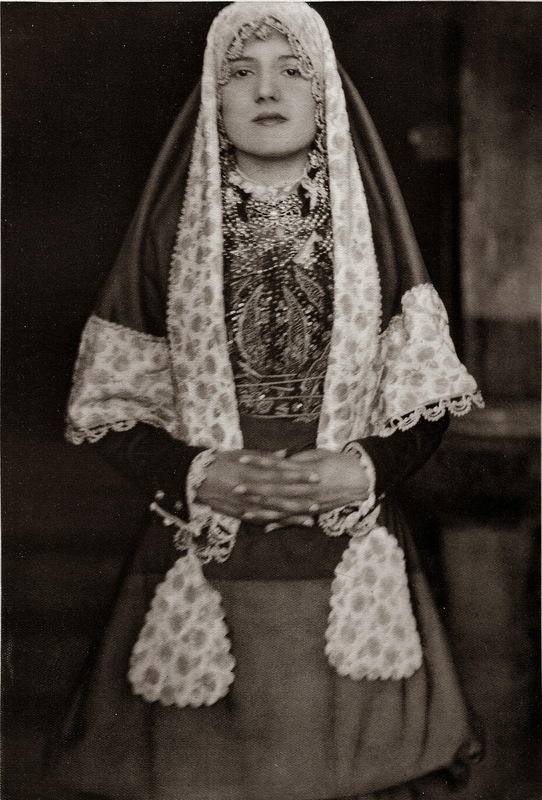 There are two small pieces attached to the corners which are used to hold the mantilla on the head. 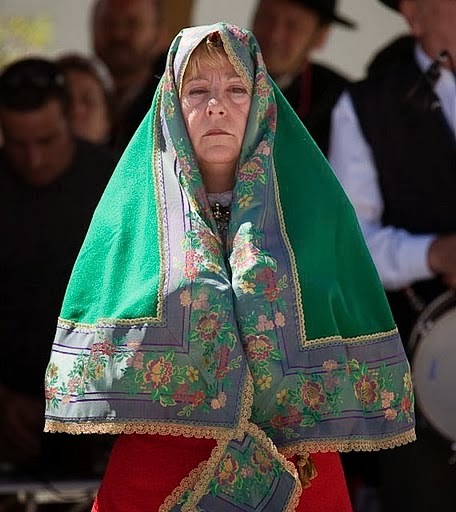 Today the mantilla is normally red. 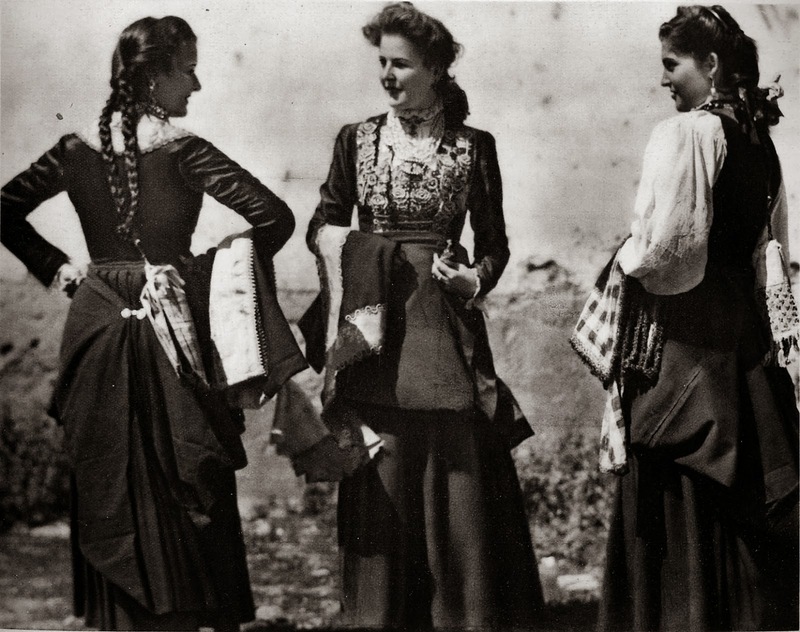 According to my sources, the topskirt is let down when attending church. This custom, while logical, is apparently no longer followed. Similar head coverings are used in other parts of Spain, and parts of southwestern Sardinia. 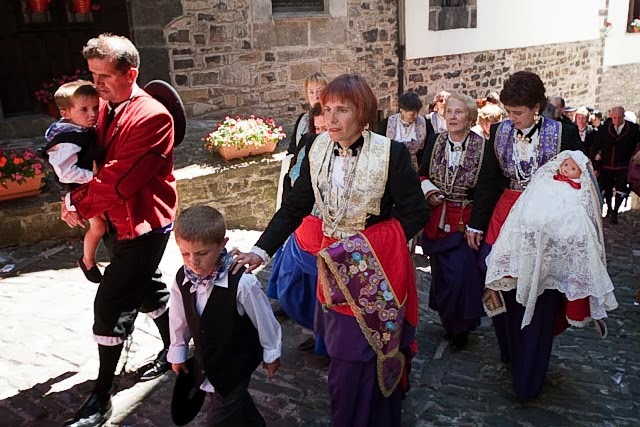 While the mantillas used in the 20th cent are red, there is evidence that they used to be made in all four of the Liturgical colors of the Roman Catholic Church, which were worn for the appropriate feast days. Widows and women 'of a certain age' wear essentially the same outfit, except that the skirt is not pinned back, and the outer garments are all black. This of course is a description of the dress clothing. Everyday and work clothes were of course simpler. 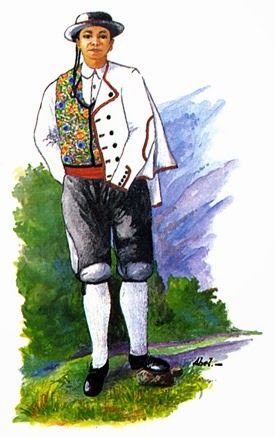 Single men wore black shoes, white stockings, linen underpants, black knickers, a white linen shirt with full sleeves, a colorful brocade vest and wide purple sash. 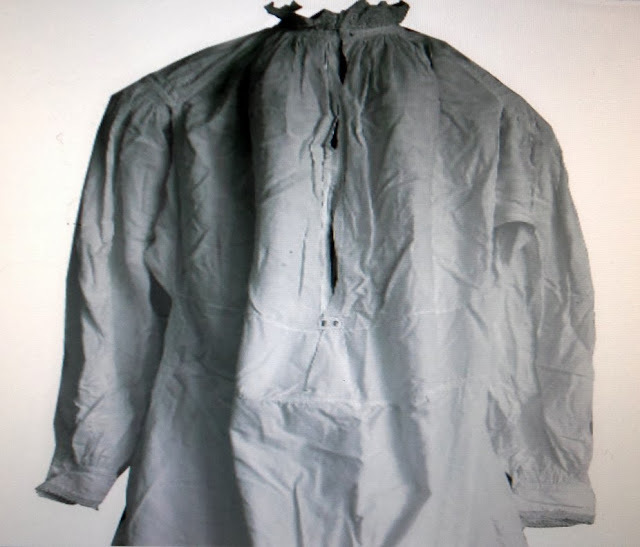 Over this may be worn a white double-breasted wool jacket with black trim and possibly topstitching. 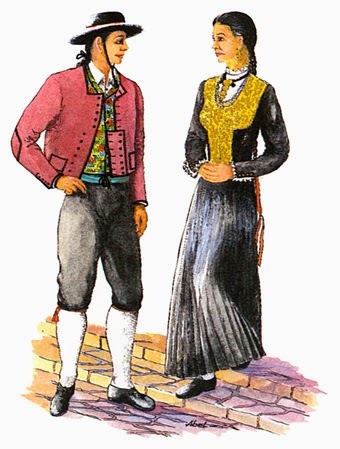 Also a round black hat with chinstrap is worn either on the head or hanging on the back. 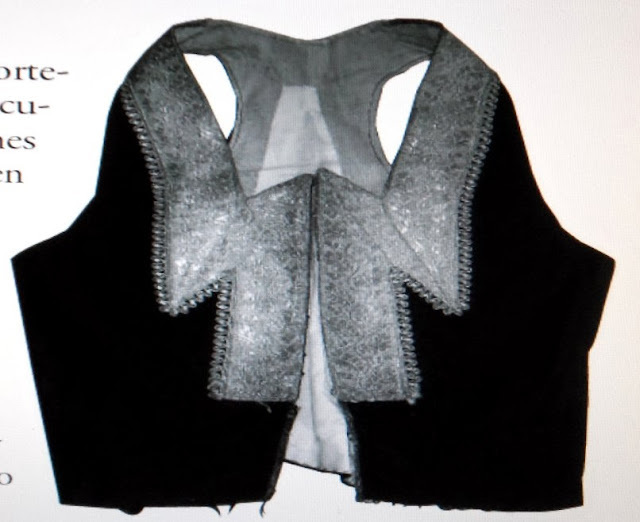 When the jacket is worn, the vest might be plain black or gray. 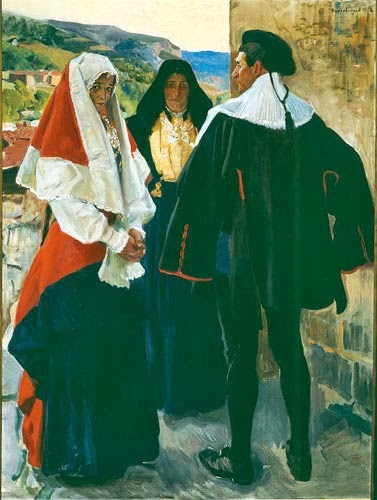 Upon his betrothal, a man changes the white jacket for a red or burgundy one. This may be worn for the first few years of marriage. After that, the man wears black stockings, a black vest and a black jacket with red trim. 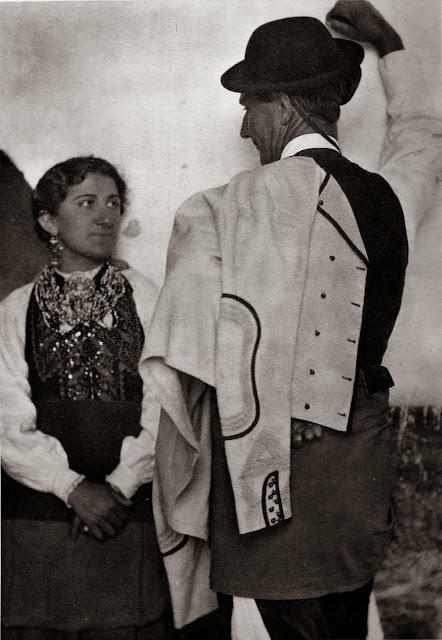 Formerly, a silk kerchief was often worn tied around the head under the hat, as in Aragon. This habit is now making a comeback. There is also a more somber, all black outfit used by older men for churchgoing. 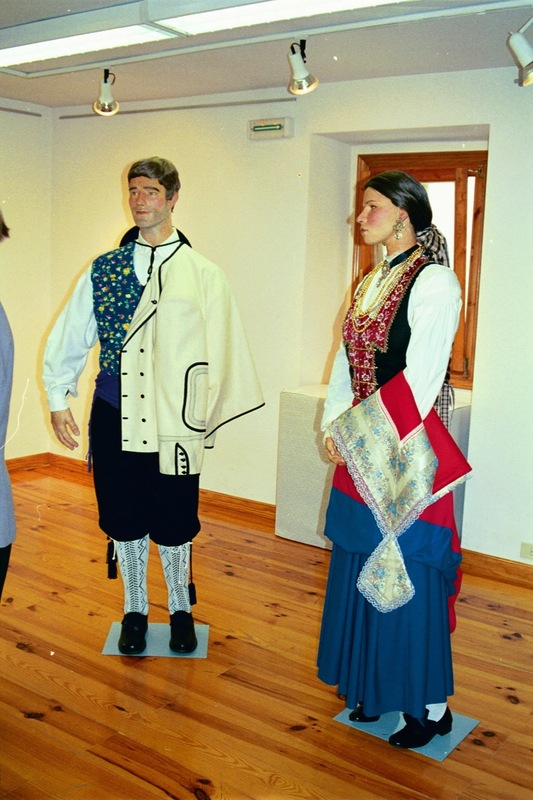 One last costume has been preserved here, as in some other parts of Spain, and that is the uniform used by municipal officials. I will end with a few more pictures of this costume. 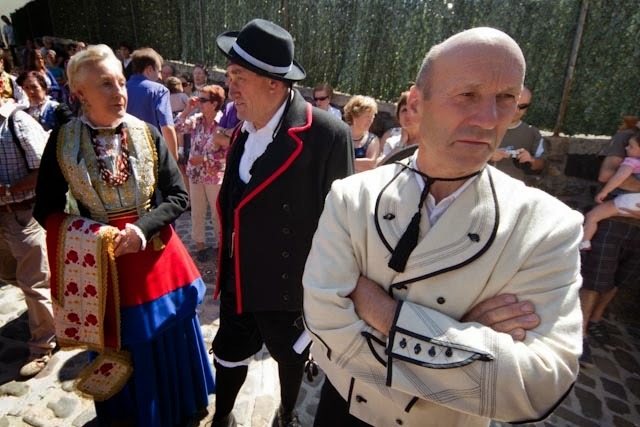 Here is a website dedicated to the costume and other aspects of Roncal - Erronkari, all in Castillian. This is a very good resource. Something about your last post. 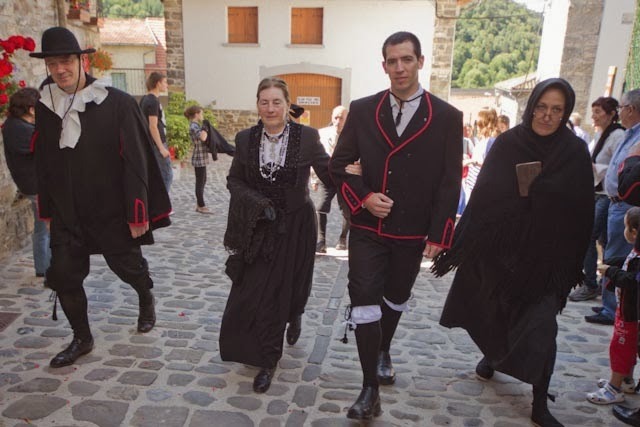 Erronkari's costume is not strictly "basque"; althought half of Navarra speaks euskera ("uskara" in Roncal's variant, whose last speaker died 40 years ago), Navarrians have a strong personality and most of them feel not basque. Also in spanish Basque Country, Alava/Araba province only has a little part where basque language is spoken, and probably the early Spanish or Castilian language was born there! 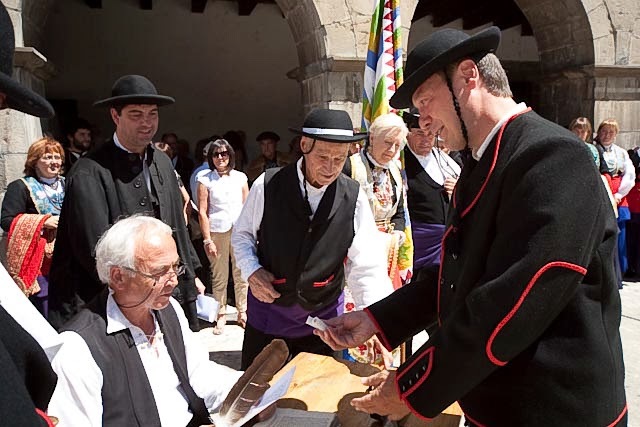 In a very simple way, early Castilian was a rustic Latin spoken by people of Basque (or para-Basque) origins. Very complex, as you can see! 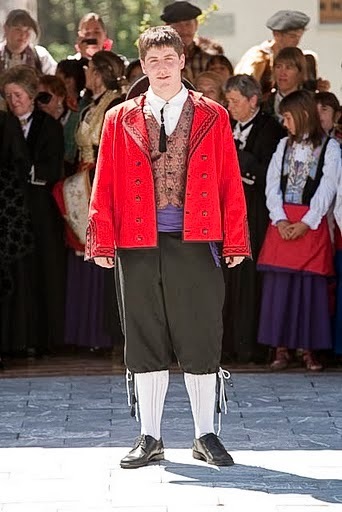 So we in Spain talk about West Pyrenees costumes, as a variant of general Cantabric costume area. 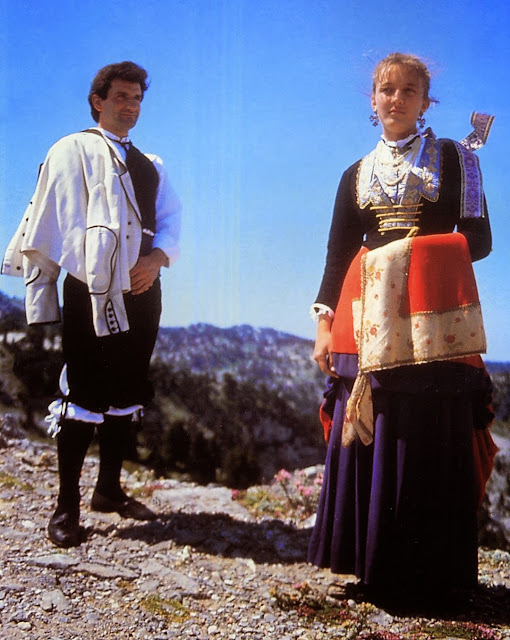 Women's costumes on Ansó and Echo valleys, close to Roncal/Erronkari are a singular survival of ancient Renaissance western costume with less relationship with nothern costumes. 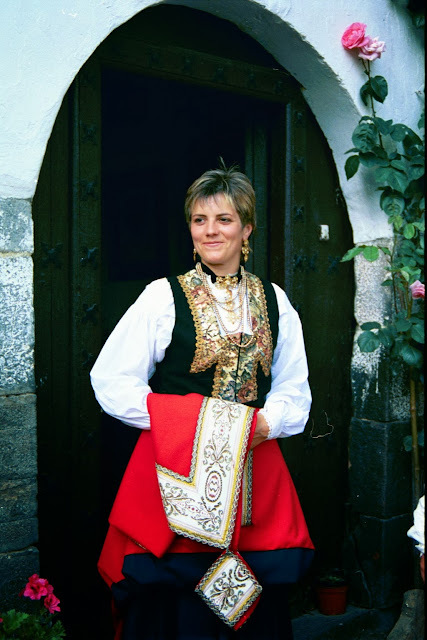 Earrings: kirkillak, kirkilles or tintillak. 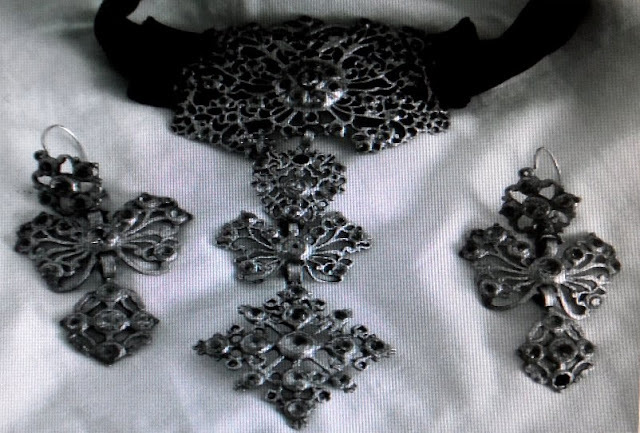 The collars are named gargantilla (Cast.) or lepoko (Usk.). 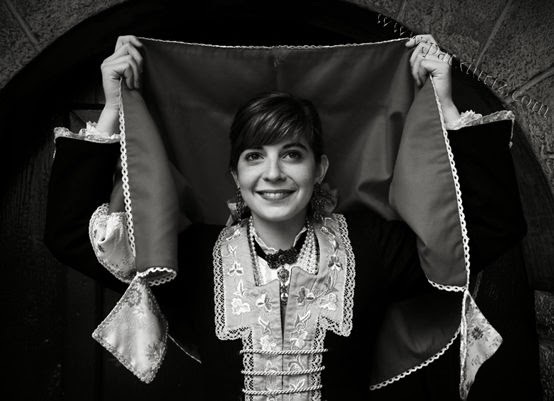 The whole jewels -earrings, collar and necklace with pendant- were named with Castilian word aderezo (general in almost all Spain and many Iberoamerican countries). 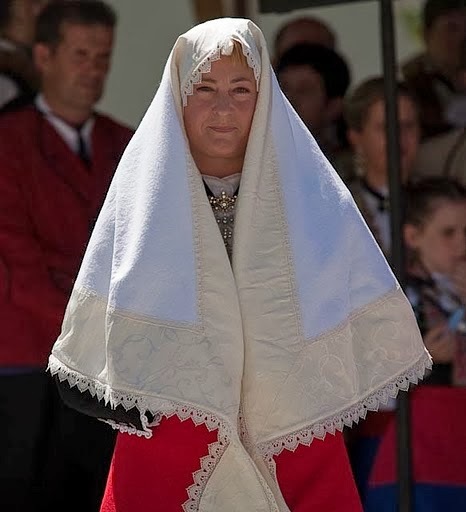 The two romboidal or triangular pieces at the tops of the mantilla are called higas (Cast.) 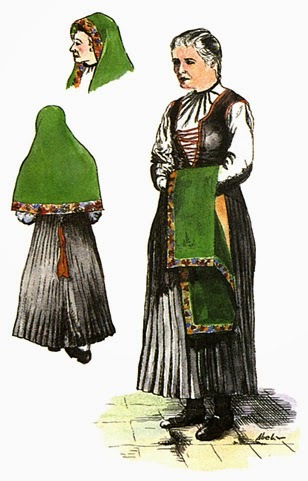 when made of brocade, and muxko (Usk.) when made of several free silk ribbons. 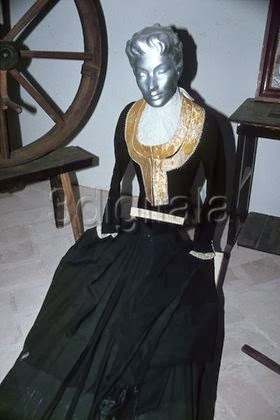 The chemise is named with several names: atorra-mantarrak, ematze-atorra or nasai; upper part is the mantar-soin, and lower is mantar-egal; embroidered neck is called anoki or anote. 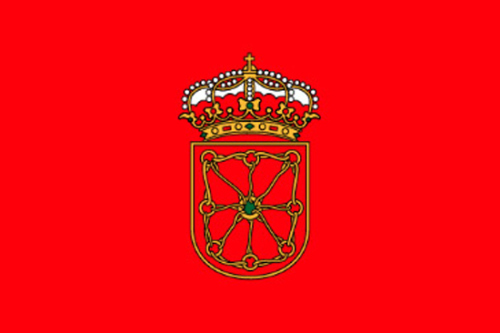 I am from Navarra, and I don't like when people says that Roncal, is part of the vasque country. 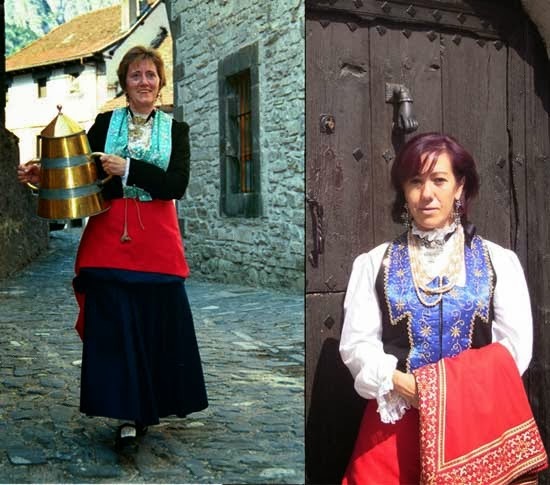 NAVARRA AND VASQUE COUNTRY, ARE TWO DIFFERENT REGIONS OF SPAIN. The flag you show is very interesting, it shows both a Christian symbol much used by the Jesuits, together with a Masonic sign. 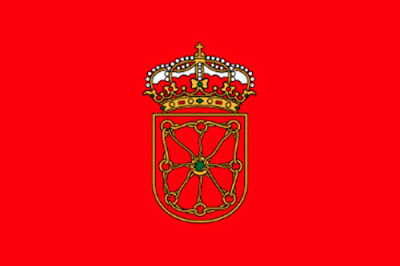 Is that an official feature of the flag of Navarre? Could you point us out to the source of that image?